I had my wisdom teeth removed a couple of weeks ago and my mum came to visit me with some soft mango (“Make a lovely smoothie with it, love!”) (hi mum), but the muscle co-ordination needed to negotiate a lovely chunky mango smoothie was just a bit beyond me and so we had a curry instead, obviously. Although I didn’t grow up in the kind of household that mixed fruit into savoury dishes (as per my anti-Coronation Chicken predilections detailed in Friday Night Lights:Chicken Goat’s Cheese and Avocado Salad), I have grown to really appreciate a layer of sweetness in dishes as a respite from savoury. Nigella, who does have some fairly interesting tendencies towards mixing the most unhealthy (but delicious) of sweet and savoury items, came through for me in a big way with her recipe for red prawn and mango curry. This dish has to be eaten to be believed. When CB first pointed it out years ago, I was highly skeptical: I like butternut squash and sweet potato well enough, but I have an inherent and irrational suspicion of any sort of curry with potatoes. There’s something about the mixing of potatoes and rice that doesn’t quite sit with me – the old chicken curry half and half and I never quite saw eye to eye. Regardless, I pressed on, and here we are today. 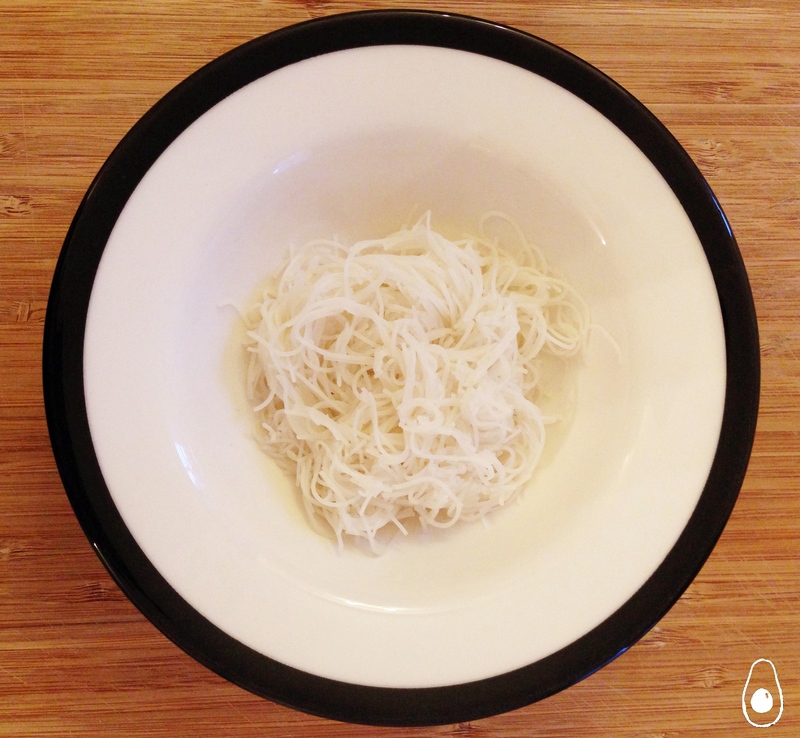 We serve this with thin rice noodles but I think this will also go well with glass noodles, egg noodles or rice. It’s a fantastic and quick weeknight meal. The taste of this will never quite leave you and trust me, you won’t leave it either! Head the oil in a pan and sauté the spring onions in the ground nut oil for a minute or so. Add the curry paste with two tablespoons of the coconut milk and stir. After a few minutes, the paste will release its aromas and your kitchen will smell wonderful. Add in the rest of the coconut milk, the stock and the fish sauce and bring it to boil. Add the butternut squash and sweet potato and simmer for around 15 minute or until soft (could be up to 20-25 minutes). To cut the simmering time, chop the sweet potato and butternut squash into fairly small cubes (this is where the pre-diced ingredients comes in handy). Once soft, add the prawns and bring the pot back to the boil then add the lime juice and mango. Cook for a minute, until the prawns are cooked through, and serve over your starch of choice. Garnish with coriander and slices of lime. This meal will also be delicious by itself as a low(er) carb option. I’m taking this recipe over to Fiesta Friday #28 co-hosted by Margot and Saucy. I highly recommend checking out the other recipes there too! So you’ll know for next time..! btw, don’t forget to made a recall visit if any simptom showing up following the wisdom teeth removal…. Ha, thanks! No, the teeth healed up just fine and I was glad to have such a tasty distraction from the pain 🙂 thanks for stopping by. Mangoes and prawns make such a fabulous match (a taste of the tropics!) and tossed through in a red curry – even better! I totally love the sound of this dish. Thanks so much for sharing with the FF crowd – what a delight! Mango and prawns, a combo I never tried. Look fantastic! Oh my goodness this looks so good and summery. 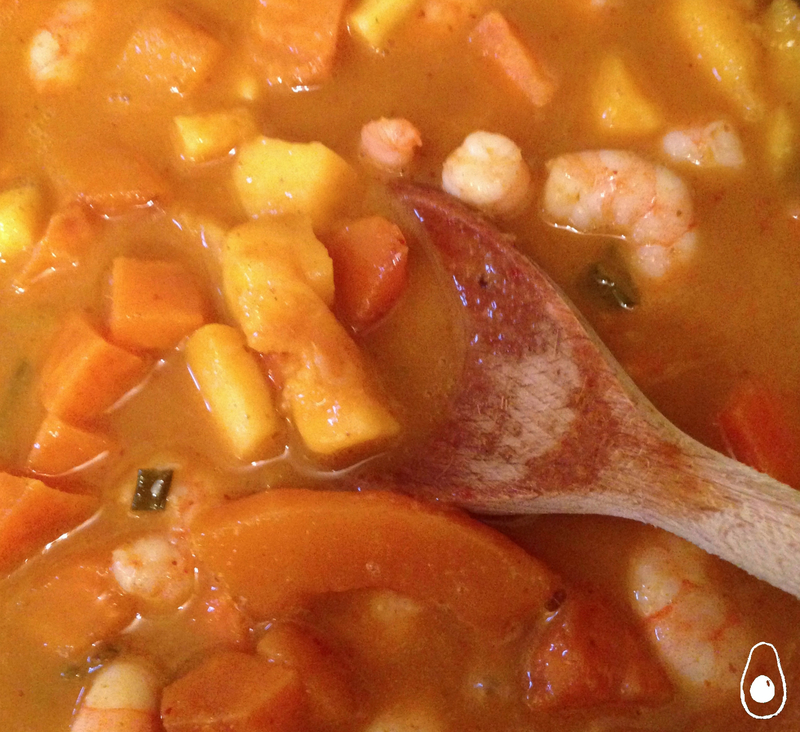 I love most anything mango, but adding the curry and prawns sounds amazing! Katherine, it was really nice and really fantastic for summer without being too heavy! Thanks for stopping by! This looks so good – absolutely mouth watering! I can almost imagine all the flavors you have going on here! Lovely! mmmm I can almost remember how it tasted too 🙂 definitely one to batch make…. Thanks for stopping by! Shrimp, curry and mango are so delish together. Thanks for sharing this combo at #theWeekendSocial. YUM! Pinned. Hope to see you again Thursday 9:00 PM EST.